People with mid-stage dementia are served by special care units in long-term care facilities, although as these residents deteriorate, they are transferred out of the unit and into a general nursing home unit. These nursing homes are not equipped to deal with palliative needs of end-stage dementia care. The book addresses those needs. 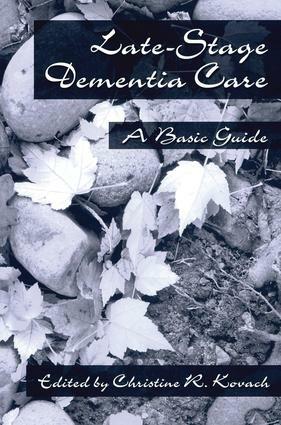 With this in mind, Part One examines the stages of dementia end-stage in particular. Other chapters in this section provide background on the hospice movement and hospice concepts; the idea of maintaining personhood; and administration of a late-stage care unit. Part Two focuses on treatment approaches for common needs in end-stage dementia - medical and physical care; a supportive environment; the fundamentals of care; psychopharmacology; and therapeutic activities. Part 3 contains chapters on family-centred care; legal and ethical issues; programme evaluation; and future opportunities.